The Employers Network is a National Network committed to equality, diversity and social inclusion; supporting organisations to develop awareness, understanding and skills to promote equality and tackle discrimination. The Employers Network for Diversity, Equality and Inclusion has been in development since 2015. We now have in place; resources, partners, materials and funding to support the work we do. The Employer Network covers all aspects of equality, diversity and inclusion issues in the workplace and the working environment. We focus on delivering high quality practical advice, products and services to our members. We aim to help organisations turn theory into practice. Working with business closely, we understand the real issues faced by employers and the barriers you come across when trying to make change happen. free telephone and email support on any equality, diversity and inclusion matters affecting your organisation. We will be available to answer any questions you have from a teaching, learning, management or training perspective. Minimum 15% discount off video and e-learning courses from our partner company, Skill Boosters. Free trial service before you buy. 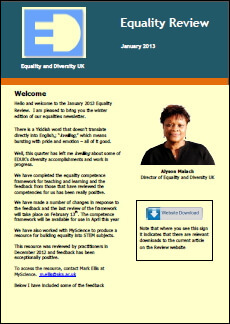 5 free e-learning licences a year covering topics such as Unconscious Bias, Equality Essentials and Transgender Awareness. Full course list available upon request. Provides its members with the information, expertise and understanding they need to promote equality, tackle discrimination, and to foster good relationships between diverse groups.